Little discoveries, everywhere. That's what it's about. One of the most beautiful aspects of science is that while there is so much we can see and smell and feel around us, there's an inconceivably large universe around us full of things we can't directly observe. The Tricorder project aims to develop handheld devices that can sense a diverse array of phenomena that we can't normally see, and intuitively visualize them so we might see temperature or magnetism or pressure as naturally as we see colour. The Tricorder project was founded by myself, Peter Jansen (PhD), while a graduate student studying neural computation and cognitive modelling at McMaster University in Hamilton, Ontario, Canada. I have been actively developing complete Tricorders from the development of the Science Tricorder Mark 1, starting in the Spring of 2007. You can learn a bit more about me here. I very much believe in the value of project-based learning to supplement traditional approaches to teaching. Having the flexibility to let a project adapt to your interests as they develop also allows one to gather both breadth and depth — and this was and continues to be the case for the Tricorder project. There are some easy examples that come to mind. The Tricorder project has allowed me to explore circuit board design, fabrication, surface mount soldering, large scale project planning — all things that supplement a traditional education in computer science or electrical engineering with open resources for making physical prototypes like Sparkfun or Make. But the most exciting examples, to me, are the ones far off the beaten path — such as exploring data visualization and interface design, or, especially, rapid prototyping. This has led to some exciting open design projects that wouldn't have been possible without the freedom to explore. 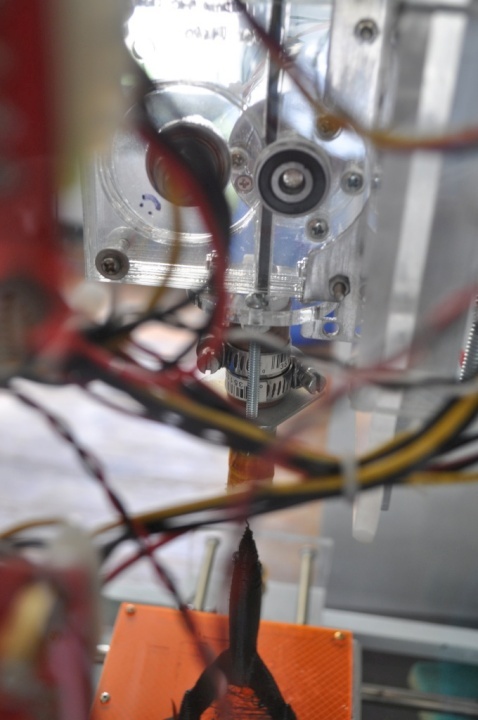 Rapid prototyping, or 3D printing, is a process where one slowly additively constructs objects by depositing material layer by layer, and has become very popular in the past couple of years through folks like Makerbot Industries and the RepRap project. Tricorder cases take a few days to make, each, and so as a wonderful exploration my Dad and I learned about 3D printing and constructed two printers of our own design. While the printed Tricorder cases didn't work out perfectly, before long we were printing out parts for the 3D printer itself, or eventually designing entirely new projects like the 3D-Printable Laser Cutter — all as a result of having the freedom to explore. Currently there are four Science Tricorder prototype models, collectively representing many hundreds of hours of development. Detailed design documents are available for both the Mark 1 and Mark 2, which are functional devices with working prototype software or firmware. 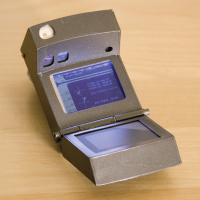 The Science Tricorder Mark 3 prototype was an experiment in low-cost design, and the current model — the Science Tricorder Mark 4 — is an experiment in data visualization and low-cost design for manufacture. The first Tricorder project prototype developed. Designed to provide a simple and intuitive tool for a variety of scientific measurements, and includes sensors for atmospheric, electromagnetic, and spatial measurement. An ambitious and visually beautiful model with a bunch of visualization capabilities. Runs Linux, and has a bunch of connectivity and development options. 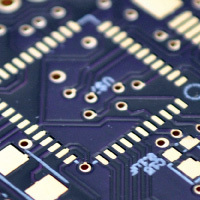 Upgradeable and self-contained sensor boards with separate processors and the beginnings of an open sensor protocol. Sensor Suite: Detachable sensor boards. Some onboard sensors. An experiment in dramatically reducing the cost of a Tricorder. Designed to interface with multiple easily swappable sensor boards that communicate using an open sensor protocol. Scripting language for user content planned. The development was discontinued before completion because it felt as though this model departed from the Tricorder philosophy of a large array of inexpensive sensors with facilities for intuitive graphical visualization for the sake of cost savings. If there is interest, I may document and post the progress on this model as well. An experiment in further dramatically reducing the cost of a Tricorder without sacrificing visualization capabilities. My hope is that this may be an initial model that could be mass produced, and that folks could have in their hands. Fabbed in November 2011, and currently undergoing software development. 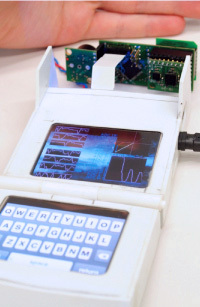 The Tricorder project is an open development effort and experiment by Peter Jansen in creating Science Tricorders. Whether you would like to share comments, suggestions, helpful thoughts, or would like to contribute to the project in some way, please feel free to contact me at peter@tricorderproject.org. The Tricorder project would not have been possible without the generous support of a bunch of folks who were more than happy to help out a graduate student building a Tricorder. 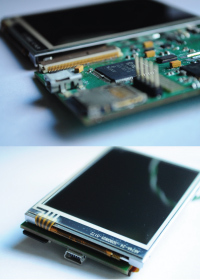 These took the form of commercial samples, educational samples, or in-kind donations from Atmel, Cirque, Melexis, Microchip, and Texas Advanced Optical Systems. I would also like to thank my Dad, who taught me how to make, create, design, build, program, and solder from a young age. I consulted him for his advice at each stage of the project, and he is ever willing to lend a hand if I need one. He also financially contributed to the project, and very much wants a Tricorder to play with, because they're "really cool".